The Netflix original series Stranger Things is taking the country by storm. Released just this past Friday, it’s already been binged by many who love its nostalgic throwback to the ’80s with a mashup of Amblin Entertainments, Stephen King stories, aural odes to Steven Spielberg and John Carpenter, and other genre mentions. (For those who are still going through the episodes, there’s the excellent reviews by Emily L. Stephens). 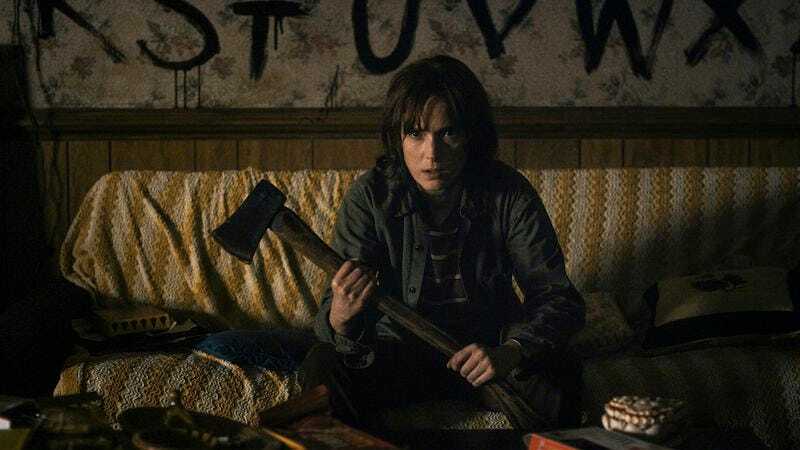 It’s fun to pick out the influences of music, TV, books, and film on the series that creators the Duffer brothers have cooked into their homage. Now, thanks to a helpful (and alphabetical) guide by Vulture, fans can see all of the ways that certain films have played into the making of this pop culture phenomenon. The post, which chronicles all of the major film references in an A-Z format, is probably best for those who have completed the series, as there are major spoilers for various events throughout. Stranger Things pulls from a number of sources, from Aliens to Under The Skin. It does so in a number of ways, whether thematically lining up with those films (like Firestarter) or blatantly calling them out with a movie poster (like The Evil Dead). It’s a veritable cornucopia of great genre throwbacks that mostly refer to works from the ’70s and ’80s that clearly influenced the writing and story of the Netflix series. Head on over to Vulture to see which ones are most obvious, which ones viewers may have missed, and continue thinking about the weirdness that befell the small town of Hawkins in 1983.